UPDATE: I’ve since learned that this option was missing because I had changed the List Settings to “Allow Management of Content Types”. If you’re having the same issue, just go to List settings -> Advanced Settings -> “Allow Management of Content Types?” and choose ‘No’. 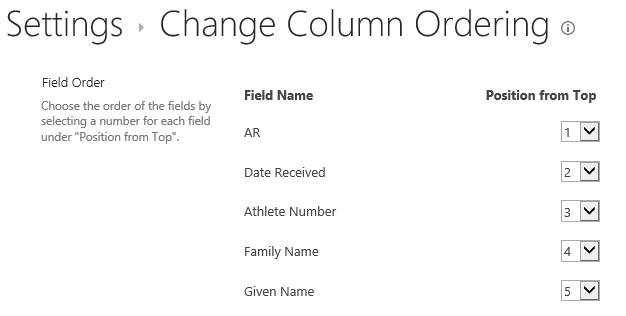 I recently had trouble locating the settings to change the order of SharePoint Online Columns in a Custom List. In my case, I added a post code field at the very end and needed a way to send it up the list with the rest of the address related fields. The default behaviour in SharePoint Online is to arrange columns in the order that they are added. When new users are adding new items to a list, they’ll typically have to add them in that order as well. I’m relatively new to SharePoint Designer, and while I was able to create a new Form and manually arrange the columns, it wasn’t an ideal solution. The List Settings on SharePoint Online also don’t seem to give the option to edit the order, and modifying the order of columns in a particular view doesn’t affect the order of the New/Edit forms. I found a solution by looking at a URL from an older version of SharePoint. First open your SharePoint Online list and go to List > List Settings at the top of the page. Press Enter and you should now see a page like this that lets you change the order of Columns in the New and Edit forms. Make your changes, press OK and try adding a new item. If you’re using the default new item form, the fields should now be in the order you specified. There may be an ‘official’ way to get this to appear, and if you know what it is please leave a comment. UPDATE again: There is an ‘official’ way, see the top of this post.